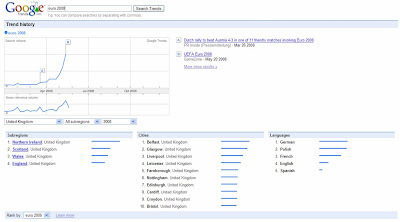 Euro 2008 starts this week and I thought it would be interesting to see who was searching for 'Euro 2008' on Google. Google Trends confirms that there is a lack of interest in England (providing a challenge for UK publishers), but also throws up some interesting results when the Google Trends analysis is widened to cover a larger geographic area. 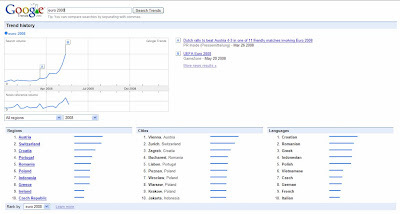 Across the world searching for 'Euro 2008' is, unsurprisingly, most popular in host countries Austria and Switzerland, followed by other qualifiers Croatia, Portugal, Romania and Poland. Intriguingly Indonesia is number 7 on this list, showing the global appeal of the Euro 2008 tournament. In the UK, main commercial broadcaster ITV have the rights to show the Euro 2008 final, but have decided not to do so, assuming that there will be a lack of public interest. This tournament will also see matches being shown through live online video streaming from a number of sources and it will therefore be interesting to see the demographic breakdown and viewer figures of the people who actually watch the games on UK TV. It will also be intriguing to see how UK publishers respond to the tournament in the absence of any 'home nations'. The Sun are considering producing a Polish version to cover the Polish national teams' matches (http://www.guardian.co.uk/media) and if this is considered a success then I'm sure others will follow similar paths. England not qualifying has meant that publishers have missed out on a large chunk of revenue ('How Macca mucked it up for the media too'), so Euro 2008 could see mainstream UK publishers reaching out to immigrant communities in a way that they haven't done before - interesting times.